The Bisnovat (later Molniya then Vympel) R-40 (NATO reporting name AA-6 'Acrid') is a long-range air-to-air missile developed in the 1960s by the Soviet Union specifically for the MiG-25P interceptor, but can also be carried by the later MiG-31. It is the largest air-to-air missile in the world to ever go into production. The development of the Mach 3+ North American XB-70 Valkyrie threatened to make the entire interceptor and missile force of the Voyska PVO obsolete at one stroke, thanks to its incredible speed and altitude performance. In order to counter this new threat, the MiG-25 was designed, but new air-to-air missiles were also required to enable the MiG-25 to engage its intended targets at the high speeds and altitudes dictated by the requirements. The Bisnovat design bureau began development of the long-range air-to-air missile in 1962. The resulting R-40 was initially matched with the Smerch-A ("Tornado-A") radar of the MiG-25. It was built in semi-active radar homing (R-40R) and Infrared homing (R-40T) versions. In order to guarantee a kill at such high speeds and in the thin air, a large warhead was needed in order to have a sufficient blast effect. Large control fins were required to give the missile enough maneuvrability at high altitude. All this necessitated a very large missile and as a result, the R-40 is the largest air-to-air missile to ever enter production. It is slightly larger than the MIM-23 Hawk surface-to-air missile. 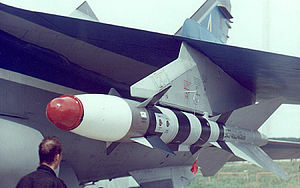 Following the defection of Soviet Air Defence Forces pilot Viktor Belenko in 1976 and the compromising of the MiG-25P's systems and the associated R-40s, Vympel developed an improved version of the missile with a better infrared countermeasures (IRCM) resistance and more sensitive seekers. The upgraded missiles were designated with the suffix -D (for 'development', "finalized"). Later -D1 versions were also developed. Production of the R-40 ended in 1991, but it remains in limited service arming surviving MiG-25 and some MiG-31 interceptors. In Soviet service, the R-40 was never fired in anger. Standard PVO procedure was to fire a 2-missile salvo at a target; 1 heat-seeking R-40T missile followed by a SARH R-40R, in order to avoid the possibility of the heat-seeking missile locking-on to the radar-guided missile. As the MiG-25 has been exported to various states in the Middle East, the R-40 has been used in combat by Iraq and probably by Syria and Libya too. 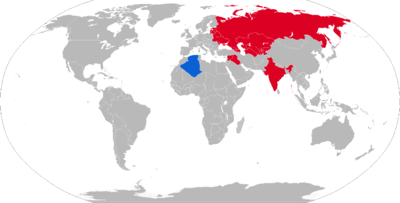 Author Tom Cooper claims that Syrian Air Force achieved an air victory on 29 June 1981 when Syrian MiG-25PD ( unit 1 FIS SAF ) shot down an Israeli F-15. This has not been confirmed. A declassified document of the CIA reports that in the first night of Desert Storm, on 17 January 1991, Scott Speicher's F/A-18C was shot down by an R-40 fired from an Iraqi MiG-25. Retired in 2008, but recent photographs suggest the MiG-31 still operates with these missiles (2010) . Retired. 660 missiles originally delivered. Passed on to successor states. ^ "Missile analysis: AA-6 Acrid" (PDF). FlightGlobal. Retrieved 4 February 2019. ^ "Р-40 (AA-6 ACRID) - MilitaryRussia.Ru — отечественная военная техника (после 1945г.)". militaryrussia.ru. ^ "AA-6 ACRID R-40". GlobalSecurity.org. Retrieved 4 February 2019.